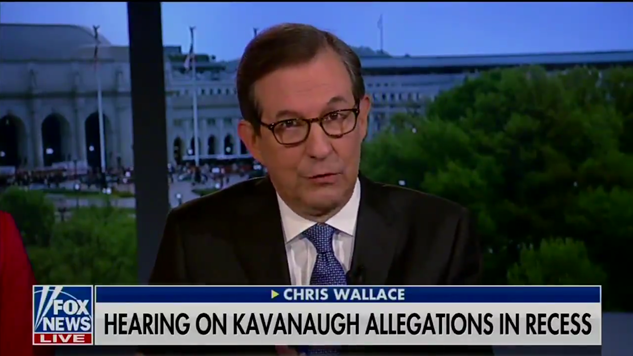 Fox News has their top line of journalists hosting today’s panel around the Christine Ford hearings, but it’s still Fox News, so you know that there’s a certain ideological line that they’re incentivized to fall on to today, but their star anchor, Chris Wallace, is eschewing that state-TV trope. Both he and Bret Baier remarked about how credible Dr. Ford has been, and Wallace didn’t mince words in how he—a journalist of 54 years—interpreted the hearings from his conservative perspective. He's right, the optics of this are a nightmare for Republicans, not to mention how incoherent these 5-minute bursts of questioning are (plus, Christine Ford named Mark Judge as a co-conspirator to all this, and the GOP has refused to talk to him, preferring to make this look like a he-said, she-said situation). Republican Senator Orrin Hatch highlighted exactly why the septuagenarians in the GOP are having a woman cross-examine Dr. Ford (and not just because the GOP has never put a woman on the Senate Judiciary Committee). The demographic split interpreting this hearing is impossible to ignore. Two male callers to CSPAN: one says Blasey Ford is lying, the other said he would take her out to the woodshed (if I heard correctly). One 76 year old woman caller says, weeping, she was molested in 2nd grade and that this testimony is bringing all the memories back. And to the “why don't women report sexual assault?” crowd, Chris Wallace has an anecdote that's pretty instructive. It's partially because of you folks, who create a culture of intimidation that makes it incredibly difficult and painful to come forward with accusations. Dr. Ford's heroism has pushed back against that culture, following the #MeToo movement in creating room to publicly talk about one of the worst days of a person's life. This is a dark day in America, but there are glimmers of light shining through the clouds, as we have entered a new world where women are to be believed.